Namor. 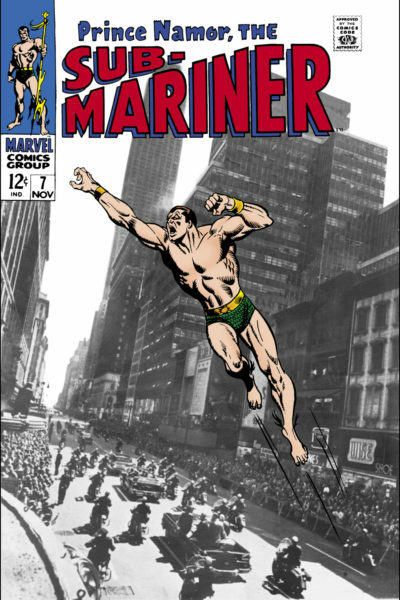 The Sub-Mariner. The King of Atlantis. He was Marvel’s first superhero, their first anti-hero, and their first mutant. Namor has been around longer than the majority of people who will read this guide, and those seventy-odd years of life have seen him inhabit as many ongoing series as Wolverine! If you enjoy Namor’s regal bearing and obstinate attitude, there are hundreds of comics to delve into – many of which have been collected into graphic novels. Namor has been a villain, an Avenger, an Invader, a Defender, and an X-Man. This guide covers every one of those appearances, from the Golden Age to the present day! Tales To Astonish (1959) – Namor co-stars in this title. 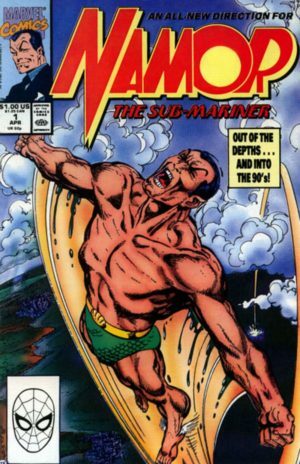 Namor appeared regularly in the first 20 issues of this series, which originally debuted under the title Marvel Comics for a single issue. He appears sporadically from #21 forward as he primarily moves into his own title. Oddly, this is not the Golden Age edition of his MMW title – it’s Silver Age, containing Daredevil #7 and Tales to Astonish #70-87. 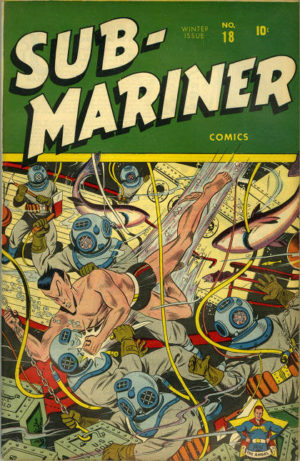 Since some readers would skip the Golden Age collections, Marvel included Sub-Mariner’s introduction here as well. Available as TPB. Collects All-Winners Comics (1941) #12, Captain America Comics (1941) #7 & 22, Marvel Comics (1939) #1, and Young Men (1950) #24. #29-92: Not collected. Namor continues to appear through issue #91. Numbering begins with #2, continuing from Red Robin Comics #1. 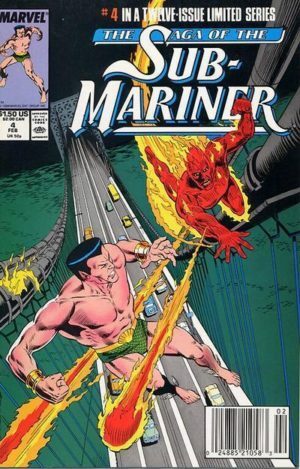 Namor appeared in back-up stories during the first 12 issues of this series. A helpful reader has confirmed that these volumes do include the Namor back-up stories (thanks Sandra!). #13-37: Not collected. Namor appears sporadically. Issue #38 was a reprint issue. Here Namor was part of a team of the earliest Marvel heroes, including Captain America and pre-FF Human Torch. Collects All-Winners Comics (1941) #1, Captain America Comics (1941) #1, Marvel Comics (1939) #1, Red Raven Comics (1940) #1, and USA Comics (1941) #1. The 1975 Invaders series fits here. Also collects Vol. 2, #1. Issue #20 was retitled to All Teen Comics (1947) and does not star this cast. Then, technically, it’s Young Allies Comics (1941) that continues from its issue #20 to this issue #21. Crazy! #33-42: This portion of the run picked back up in 1954 during the Atlas Era, below. 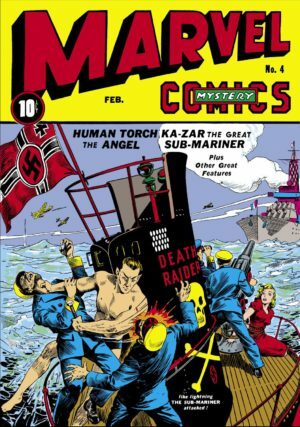 Continued from Daring Mystery Comics #1-8, which did not feature Sub-Mariner. #9-12: Not presently collected, but this is among the next volumes in line for collection in Masterworks, since #1-8 have recently been collected. This 1970s series was set entirely in flashback to World War II, continuing the Timely Comics team-up of Namor, Captain America, and the original Human Torch. and All Winners Comics (1941) #4. The newest collection of this material is a two-volume “Invaders Classic” series that collects all of the major Invaders material in chronological order. Also collects Giant-Size Invaders #1 (which is first in continuity), Marvel Premiere #29-30 (#30 follows #6), and Annual 1 & Avengers #71 (somewhat concurrent, occurring prior to #16). Issue #41 is followed by Giant-Size Invaders (1975) #2 [published later in 2005] and Invaders (1993) #1-4, both collected here, along withWhat If? (1977) #4. Click for guest appearances in this period. Previously, the series was collected in Invaders Classic, which inexplicably omitted Giant-Size Invaders #2. Also collects Giant-Size Invaders #1 and Marvel Premiere #29-30. Also collects Invaders (2003) #1-4. Material in Giant-Size Invaders (1975) #2 [published in 2005] follows #41 and precedes the 1993 series. Click for guest appearances after the end of Invaders (1993). Avengers/Invaders (2008) #1-12: A 12-issue limited series under the Dynamite Entertainment imprint. Available in hardcover and trade paperback. After Avengers/Invaders, Namor appears in flashbacks in New Avengers (2010) #29, Clandestine (1994), and Black Panther Vol. 4 (2005) #21. The Marvel Universe of World War II heroes was briefly revived in the early 50s before Marvel completed turned away from heroes until 1961. Collects Collecting Marvel Boy #1-2, Astonishing #3-6, and Young Men #24-28 (starring Namor!). Men’s Adventures #27-28, Captain America #76-78, Human Torch #36-38 (with Namor backups), and Marvel Super-Heroes #16. Atlas Era Appearances (may not be complete): Young Men (1950) #24-27 (3rd story), Human Torch Comics (1940) #36 (3rd story), Men’s Adventures (1950) #27 (3rd story), Young Men (1950) #28 (3rd story), Human Torch Comics (1940) #27 (3rd story), Sub-Mariner Comics (1941) #34, Men’s Adventures (1950) #28 (3rd story), Human Torch Comics (1940) #38 (3rd story), Sub-Mariner Comics (1941) #35-42. Saga Of The Sub-Mariner (1988) #6 runs alongside Sub-Mariner Comics (1941) #38 but also covers the period directly following #42, which is also addressed by flashbacks in Prince Namor, The Sub-Mariner (1984) #1. The Fantastic Four debuted in 1962 with a new incarnation of Marvel original hero, The Human Torch. It turned out that his longtime uneasy ally wouldn’t be far behind. 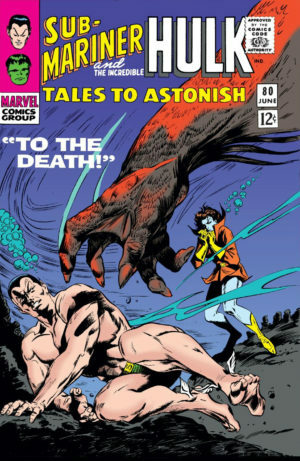 Namor returned to the Marvel Universe in Fantastic Four #4 and continued to make guest appearances for three years before landing his own title in Tales to Astonish. Namor’s re-emergence in Fantastic Four #4 is one of those famous Silver Age stories that is reflect in many later flashback tales, among them Tales Of The Marvels: Inner Demons (1995) and Saga Of The Sub-Mariner (1988) #7. An anthology title that collects multiple stories per issues. Namor begins appearing monthly starting in issue #70 through the series end in #101, at which point it continued as The Incredible Hulk. Though some Hulk collections include issues from #60 forward, they contain only the Hulk stories – not the Namor adventures. Collects Marvel Comics #1, Daredevil #7, and Tales To Astonish (1959) #70-87. Also availabe in paperback! Collects Tales to Astonish (1959) #88-101, The Sub-Mariner #1, and Iron Man and Sub-Mariner #1 (which featured two separate solo stories to transition from each character’s anthology series to their new solo series). This volume does not collect any issues of this series, but starts with Namor’s run in Tales To Astonish. Collects Marvel Comics #1, Daredevil #7, and Tales To Astonish (1959) #70-87. Also available in paperback. Also collects Tales to Astonish (1959) #88-101 and Iron Man and Sub-Mariner #1. After #25: Namor appears throughout the retcon series Fantastic Four: The World’s Greatest Comic Magazine #2, 7-9, 11, and implied in 12. This is followed by a flashback in Iron Man (1968) #25. After #30: Fantastic Four #102-104 (and also X-Men: Hidden Years (1999) #12 during 102). Also collects Marvel Spotlight #27. 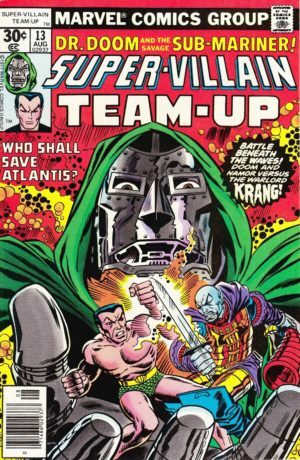 After #72: Giant-Size Defenders #3, Captain America #181, Giant-Size Super-Villain Team-Up (1975) #2, and continues to Super-Villain Team-Up, below. 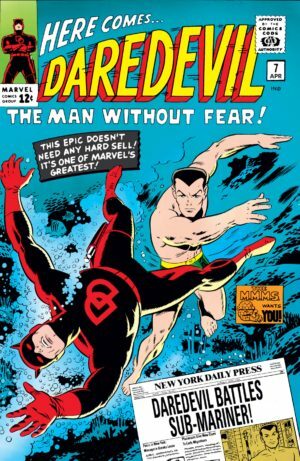 Namor then continues to Super-Villain Team-Up, below, through #15 before returning to Defenders in #74. A sort of anti-Avengers originally anchored by Dr. Strange and The Hulk. Namor appeared monthly in issues #1-14 concurrent to the close of his own title, then proceeds to Super-Villain Team-Up (below), and then returns here for #52-56, 74, 78-85, and 92-93, 98-101, 107-109, 111-116, 122-125. Starting with issue #123 this title starred Angel, Beast, and Iceman before they moved on to X-Factor. See Defenders for collection information. After #116, Namor also appears in Marvel Super Hero Contest Of Champions (1982) #1 (and implied in 2-3) – see Marvel Universe Events. After #56: Fantastic Four (1961) #194-195, Doctor Strange Vol. 2 (Master Of The Mystic Arts) (1974) #31-32, and flashbacks in Defenders (1972) #119, Alias (2001) #25-26, Iron Man (1968) #120-121, then present-day material in Iron Man (1968) #120-122 before returning in Defenders #74 and 78-85. Begins after the end of Namor’s solo series and Defenders #14. Namor appears through #13 before returning to Defenders for #52-125, directly above. #1-14: This was a straight reprint of the first fourteen issues of the 1968 Sub-Mariner series. #1-4: Not collected. Four-issue mini-series. After his brief mini-series, Namor was once again relegated to a guest-star. The story in Saga of the Sub-Mariner was released here, although it is entirely a flashback. 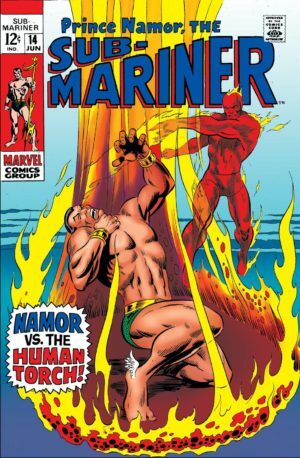 A twelve-issue limited series reviewing the highlights of Namor’s career, paired with a similar 4-issue version for The Original Human Torch. 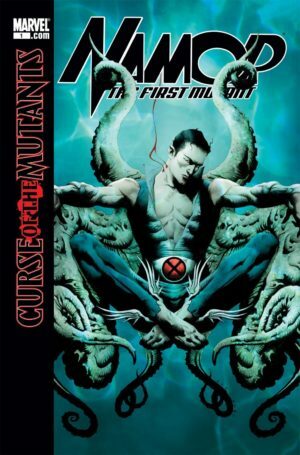 John Byrne wrote and penciled issues #1-25 of this series, after which Byrne continued to write for another arc penciled by Jae Lee, who continued through #38. Future X-editor Bob Harras took over scripting duties for issues #33-40. #19-59, Annuals 1-3: Not collected. Annuals 2-3 before/during #26, Annual 4 after #50. Atlantis Rising emerged directly from the end of Namor’s 1995 series. He continues to appear in Fantastic Four from #403 until the end of the series with Onslaught. See Fantastic Four for collection information. Click for guest appearances through the end of Fantastic Four (1961). Namor moved with Fantastic Four into the Heroes Reborn pocket universe, where he appeared in Fantastic Four Vol. 2 (1996) #2-3 & 12, Iron Man Vol. 2 (1996) #12, Captain America Vol. 2 (1996) #13, before returning to the mainstream Marvel Universe with Heroes Reborn: Return (1997) #4. Click for guest appearances after Heroes Reborn. This 1993 series is set in the original 1975 Invaders continuity, which occurs during World War II. Got it? It directly follows Giant-Size Invaders #2. Collects this limited series alongside Invaders (1975) #35-41. A 12-issue series from the superstar combo of Erik Larson and Kurt Busiek. It continues directly into The Order. See Defenders for collection information. #1-12: Not collected. A young Namor story that was part of the Marvel Tsunami line, which also featured Emma Frost and Mystique. A five-issue limited series, generally comedic in tone and not well-received by fans. See Defenders for collection information. #1-6: A six-issue limited series titled “Revolution,” which moves forward the story of Atlantis after the events of Civil War. Collected in trade paperback. A 12-issue limited series under the Dynamite Entertainment imprint. This primarily stars the Namor of the Invaders era, from between their 1993 and 1993 series, though present-day Namor appears in #3-4. #1-12: Available in hardcover and trade paperback. Written by Brian Bendis, this series ret-cons Namor as a player in the entire history of major conflict in the Marvel Universe, along with Iron Man, Mr. Fantastic, Professor Xavier, and Dr. Strange. #1-6: Collected as New Avengers: Illuminati and variously along with New Avengers. #1-5: Collected in hardcover and trade paperback. A Marvel Knights series recounting Namor’s origins. Reprinted in 2019. Namor joins the team by way of Dark Reign in the Utopia crossover with Dark Avengers starting in issue #513 through 531, and remains a main character in the book from that point forward (though he is not in #516, 518, 521, 523, 526, 529-530). A five-issue mini-series telling a modern-day tale of the Invaders, reassembled by Vision. Collected in hardcover and trade paperback. This Namor ongoing sprang up at the same time as X-Men, Vol. 3, but couldn’t generate enough sales to stay alive past issue #11. After #8: Namor stars prominently in the second arc of Avengers (2010) in #8-12. See Avengers (2010) for collection information. A short-lived Defenders relaunch out of the Fear Itself: The Deep mini-series. See Defenders for collection information on both. 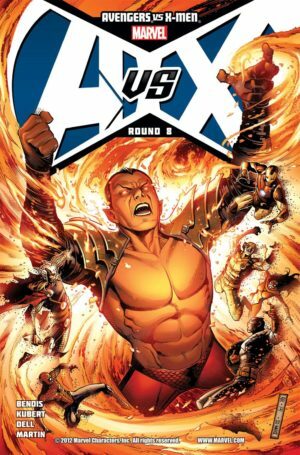 Namor continues as one of the core members of Cyclops’s X-Men for the duration of Uncanny X-Men, Vol. 2, penned by Kieron Gillen. From there, he was one of the major characters in this linewide event, resulting in his greatest displays of power but also his greatest sins. See Marvel Universe Events: Avengers vs. X-Men for more information. The former Illuminati are the focus of this relaunched Jonathan Hickman Avengers title with Namor playing a critical role. See New Avengers (2012) for collection information. 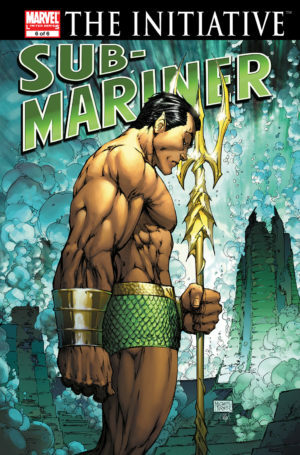 Subsequently, Namor appears throughout Secret Wars – see Marvel Universe Events for more information. Namor joins Captain America, Winter Soldier, and the original Human Torch for a new Invaders title with an intergalactic bent. This title begins after Infinity and New Avengers #15, crosses through the Original Sin event, and ends just after the finale of Axis. Namor continues to appear in New Avengers throughout this series; his next significant appearances afterwards are a part of the “Time Runs Out” eight-month leap forward in Avengers and New Avengers. Also collects material from All-New Marvel Now Point One. 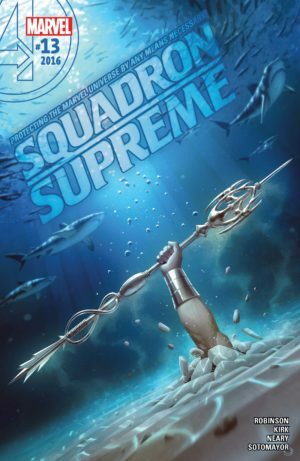 Namor makes a significant appearance in Squadron Supreme (2016) #1-2 (and later in #9 & 12-15) that I won’t spoil, but then disappears for a while – which means the following appearances may be flashbacks or otherwise not in continuity. Namor appears as a foe in Jason Aaron’s Avengers beginning in the second arc; see Avengers Flagships. Check Amazon for Marvel’s newest Namor or Sub-Mariner titles.